Today I had the absolute pleasure of attending the Tucson Ballet's production of Swan Lake. I'm not much of a ballet connoisseur; having attended exactly one other time before today. I accompanied my Aunt, who is visiting from out of state, and my Mom as a celebration of my Mom's birthday (70th. And she's going to be totally annoyed I put that in here for all the interwebs to see. Hi Mom!) and the visit of my Aunt. We also chose to go because a friend of mine, Libby, is one of the dancers. It was fantastic! Absolutely everything, from the stage dressings, costumes, music and, of course, the dancers, was perfect. All that power displayed so gracefully. Though I must admit I spent a good portion of my energy furiously searching the dancers to determine which one of the swans was Libby, who, once I would blink, would be mixed among them and autonomous once again. I would follow her progress for as long as possible, before I was distracted by an incredible lift, impossibly long leap, or the swirl of dancers. Libby of everyday life is pretty casual, fairly soft spoken, even, if you will, a bit unassuming in that she is just a normal person going through a normal life. But not so much really. Libby on stage simply transforms. She radiates grace and power. It is an incredible thing to behold. I now know what they mean when they say "stage presence". She has it by the bucketful. We weren't allowed to take photos during the performance, so I have no images of today's festivities. I do however, have a couple of photos of Libby humoring me ("No, a little more up. A bit more to the left. Perfect, don't move. Hold it. Keep going...") during a break in working on the Meteorite Men Kansas (season 2) shoot last year. 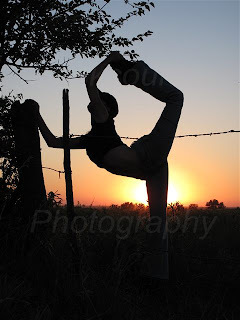 Anyone who can hold a pose like that without stretching and without falling over while wearing unwieldy hiking boots, deserves mad props. What a great way to spend time with you Mom on her birthday.. 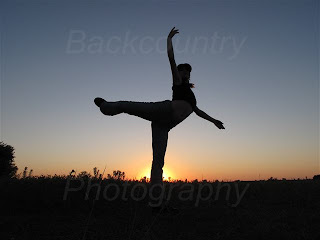 I love the silhouettes... your friend looks so graceful, joyful and strong... I wonder if in her next life she will be a greyhound... ( I mean that as a compliment! )!